Coming to your inbox weekly! Thanks for a great Montessori Ed Week! 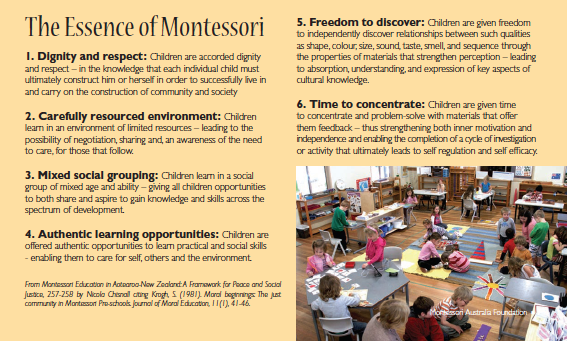 What is the Essence of Montessori? Click HERE for the MSBG video shown at the Gala! Click HERE for an international Montessori video. What a spirited week we've had! When you visit the classrooms, check out all the beautiful things parents had to say about the teachers for Teacher Appreciation Day. And join us for our next CAPE meeting, Tuesday the 3rd at 6:30pm in room 201! CAPE needs your input on the Spring Fundraiser! We have a lot of great options for the Spring Fundraiser this year! We need your vote as to what YOU would like to sell, buy or provide as a gift. Donâ€™t forget, the items received in the Spring Fundraiser will be delivered in time for Motherâ€™s Day! 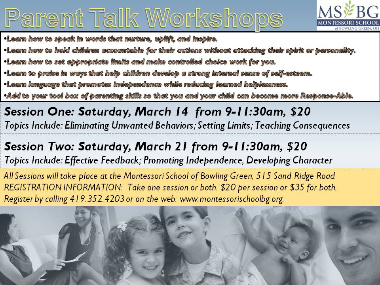 Parent Talk Saturday Sessions in March! Take one session or both! $35 if you take both! Click HERE to register! A huge THANK YOU to all of our sponsors, donors, parents and teachers who supported our MSBG Roaring 20s Gala Fundraiser! It was a wonderful evening! We are so grateful for all the love and support for our school and for the children we serve. The funds raised will be allocated to upgrading our safety systems throughout the building to include building-wide paging and improved building access monitoring. 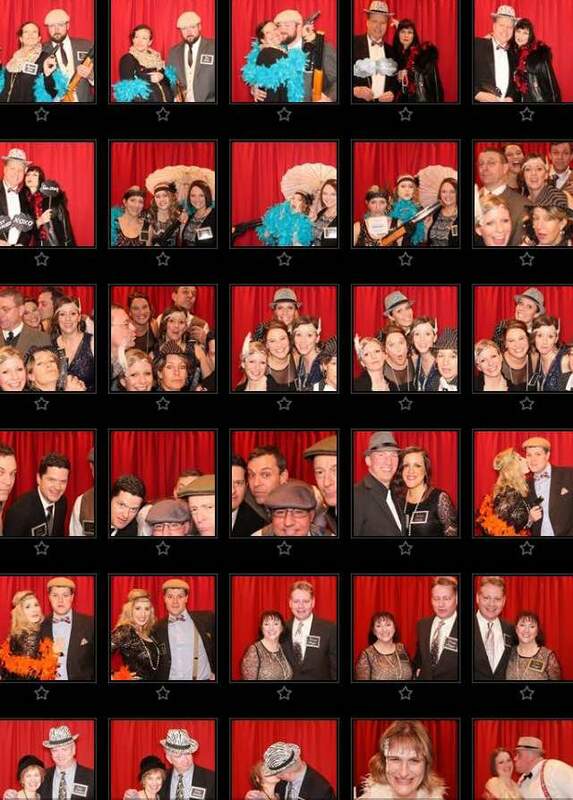 HERE is a link to the Photo Booth pictures. Free downloads for a limited time! We are planning a special event to celebrate the love of reading. 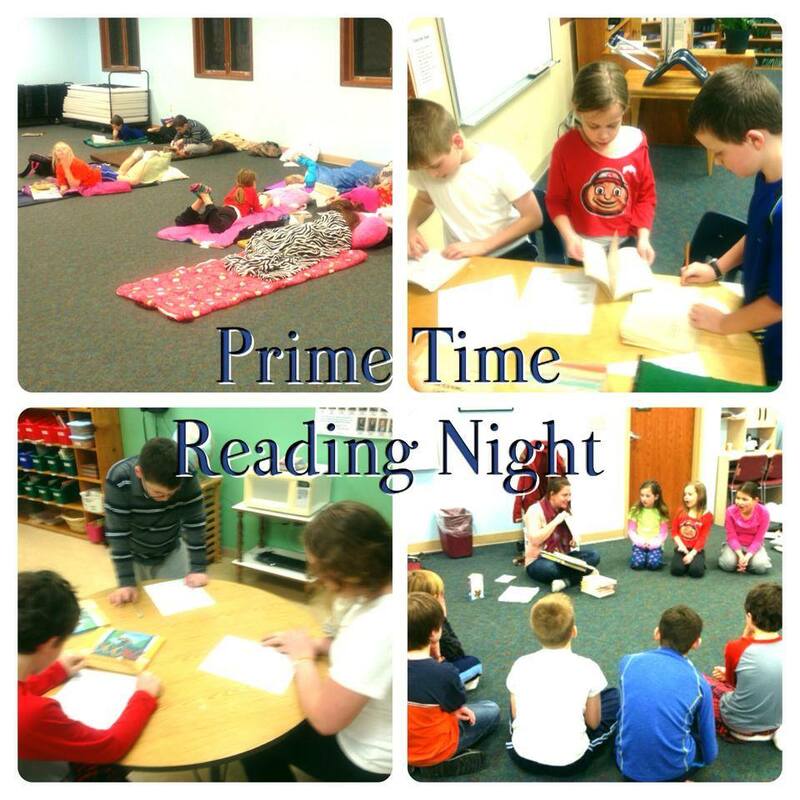 Friday Night Prime Time is an overnight reading event for the 3rd-6th grade students and will be held on Friday evening, March 6, 2015. Its purpose is to encourage students to read by providing the time to read and by combining reading with other enjoyable activities. Click HERE for more information. Happy thoughts to the Daniels family, and our 4th grader, Hayden, as they move to Wake Forest University in North Carolina in the next few weeks. We will miss you! 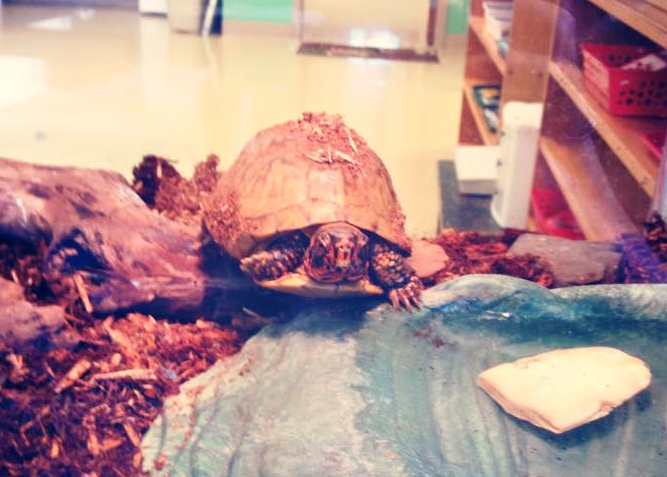 Happy thoughts to Ed, our turtle, who came out for a bit and then went back under the mulch. A sign of Spring regardless! Thank you to Marie Pendleton, for her donation to our upper elementary â€œin honor of Hayden and the Daniels family with my thanks for entrusting me with the sale of their home.â€ An additional thank you to Mark Pendleton for his offer to refurbish some of the furniture in the room utilizing the donated funds. Your support is appreciated! BG Parks and Recreation has a variety of activities for all ages. Click HERE for more information. Kids' Tech U at BGSU is for students ages 9-12 who are interested in the fields of science, technology, engineering and mathematics.Click HERE for more information. 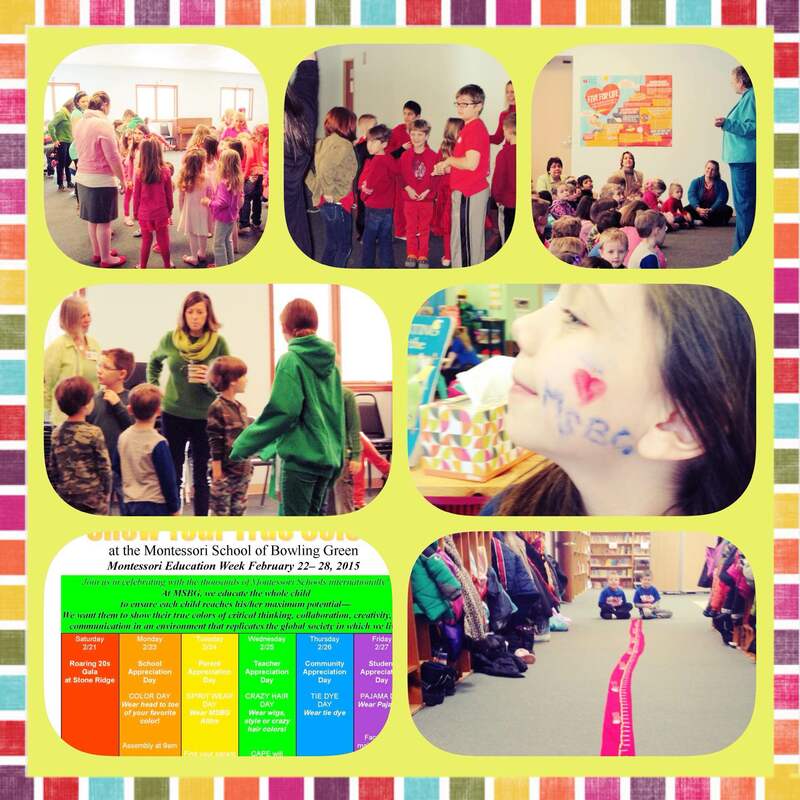 The Horizon Youth Theatre has a variety of activities for area youth. Click HERE for more information. The White House published a press release announcing a free annual pass to all national parks for students in fourth grade and their families, beginning this coming fall. Click HERE for read more. Copyright Â© 2015 Montessori School of Bowling Green, All rights reserved.